Mutations can occur in all living things but this event is very rare. Mutations are usually in the form of a system disability or abnormal formation in the body. Below are some genetic mutations in humans found in history. The picture below may make you shock, therefore the image is hidden. Please click on the "Show / Hide Images" button to view or close the image. Ectrodactyly comes from Greek, extras (abortion) and daktylos (fingers). 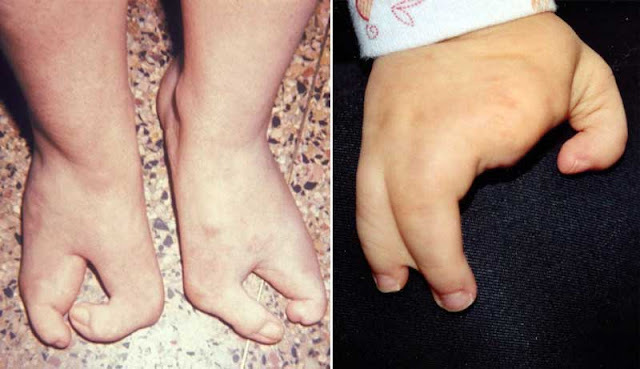 In connection with the phenomenon of disability in the hand in the form of a lack of the number of fingers, the hand split / split foot malformation (SHFM) is sometimes also called the claw hand. There are only thumbs and one other finger (little finger, ring finger or both) this disorder has also been found in the legs. This is a rare congenital abnormality that causes disrupted hand growth. This disorder inhibits growth in the middle, forming a V-like slit. Lesch-Nyhan Syndrome (LNS) is a condition where a person has an accumulation of excess uric acid, gout is a waste product of the body's metabolism found in blood and urine. But individuals with Lesch-Nyhan release excess uric acid through their blood which forms under the skin causing gouty arthritis. It can also cause kidney and bladder stones. This disease also causes neurological disorders in the form of involuntary movements such as jerks, waving hands, muscle tension or seizure spasms. In addition, it can cause self-harm behavior such as banging your head and biting your fingers. 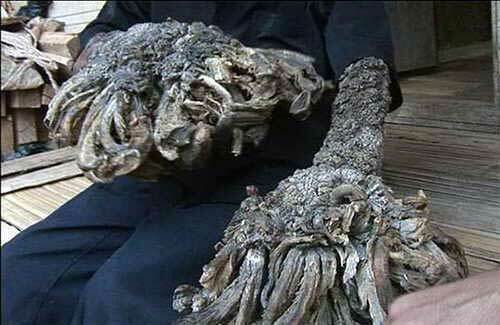 This is a disease that had a scene in Indonesia in 2007 ago, Dede the Human Root suffering from a very rare disease where all over his body is covered with warts which causes his body like roots in his hands and feet. Epidermodysplasia verruciformis is a very rare disorder that makes people vulnerable to infection with human papillomavirus (HPV). This infection causes macules and papules to grow on the hands, feet and even the face. Parasites in this skin appear as wart-like protrusions even like wood and horns with reddish-brown pigmented plaques. This area of the body that is overgrown with warts is usually in areas exposed to sunlight such as on the palms and feet even on the face. 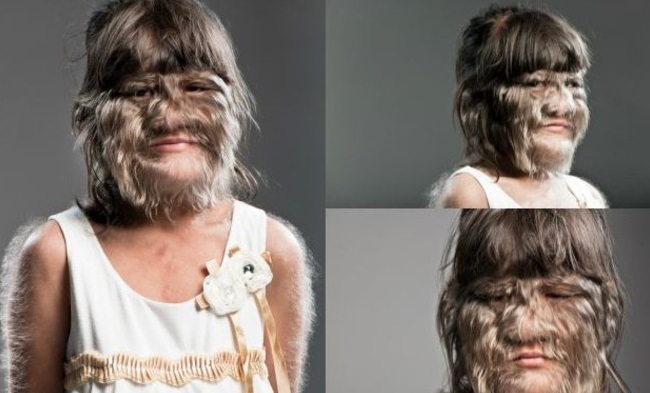 Hypertrichosis or wolf disease makes people have hair all over their bodies like wolves. This disease is very rare to find only one in one billion births in the world. Characteristics of hair that grows uncontrollably in the area of the face, shoulders and ears. This phenomenon occurs due to disruption of the connection between the epidermis and dermis when hair follicles form in the fetus when they are 3 months old. Usually, signals from the dermis send messages to form follicles where hair will grow. In forming a follicle, it sends a signal to prevent the surrounding area from becoming a follicle so that it produces the same distance from our five million follicles. Progeria is a rare genetic disorder that can make people get old or experience aging faster than normal people. People born with this disease will die at the age of 13-20 years. The cause is like a disease commonly suffered by older people such as stroke, hypertension and heart attack. Progeria develops at least 1 in 8 million births in the world. This disease is caused by LMNA gene mutations, which are proteins that provide support to the cell nucleus. Symptoms of people suffering from progeria include stiff skin, baldness, bone abnormalities and decreased growth. Progeria is very interesting for gerontologists who hope to connect genetic factors with the aging process. 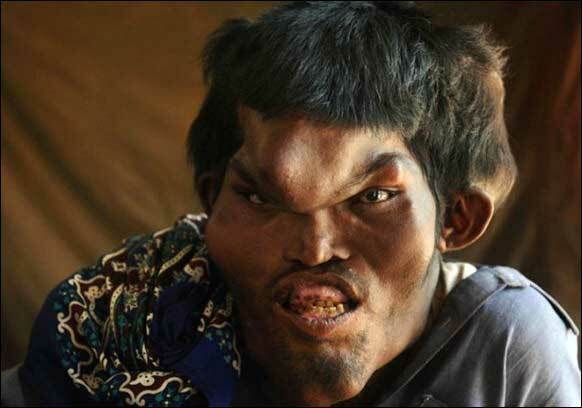 The picture above is 22-year-old Sain Mumtaz, one of the proteus syndrome sufferers from Lahore Pakistan. This disease makes the head of a large body irregular people call it elephant man. 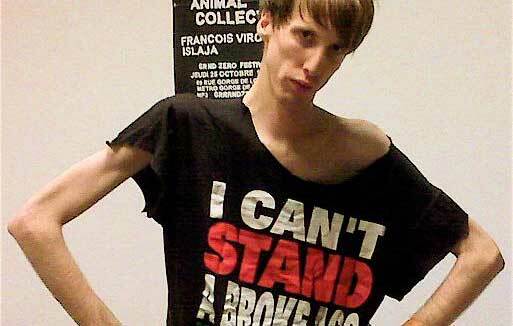 Proteus Syndrome is indeed a rare genetic mutation that makes bones, skin, meat grow excessively. Worse, this growth occurs irregularly, causing strange shapes and imbalances in body proportions. Proteus symptoms usually appear after 18 months after birth and can be found every 1 in 1 million people. This disorder is caused by mutation of the AKT1 gene, the gene that regulates cell growth. When cells grow and develop, some cells show mutations while others don't. This combination of normal and abnormal cells causes overgrowth. Trimethylaminuria is also called Fish Odor Syndrome. 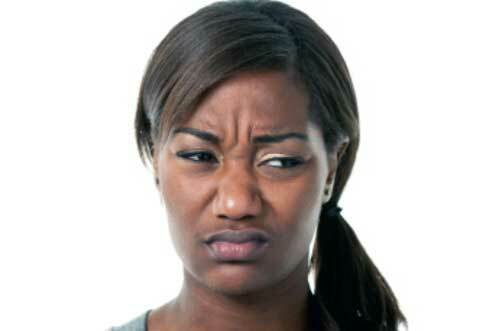 This one disorder is also very rare, where someone gives off an unpleasant smell like a foul odor. rotten eggs, garbage, dirt, etc. This odor usually arises from metabolic waste produced by the body such as urine, sweat, breath, etc. Most sufferers are women, the smell gets worse when menstruating or in phases related to estrogen and progesterone hormones. As a result, people with Trimethylaminuria often experience social pressure and depression because they are embarrassed if the smell gets smothered, surely people will stay away from it. Marfan syndrome is a genetic disorder that causes connective tissue disorders (tissues that regulate body structure). The characteristics of marfan sufferers include high and thin body, curved spine, small lower jaw, sunken eyes, flexible joints. Besides this disorder can cause eye disorders such as cataracts, nearsightedness, glaucoma, and retinal detachment. This disease is very common and can be found in every 10,000 to 20,000 births. It is said that Abraham Lincoln also had this disease. Normal people generally walk quite 2 feet (bipedal). But not with patients with Uner Tan Syndrome. Instead of using 2 feet they actually use both hands to walk like 4-legged animals. The name of Tan Syndrome (UTS) was first coined by a Turkish evolutionary biologist named Uner Tan. He studied the peculiarities of the behavior of the 5 members of the Ulaş family in Turkish countryside who walked on quadrupedal systems, used primitive language, and had congenital brain damage or impaired consciousness. 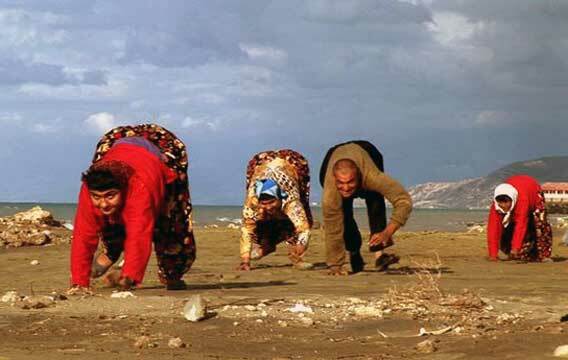 This family story was documented by the BBC in 2006 entitled "The Family That Walks On All Fours". According to Tan, this is a genetic mutation that shows the transition of human evolution from quadrupedal to bipedal. SCID Is a genetic disorder that causes the sufferer to be easily attacked by the disease because the body's immune system is very weak. Babies born with this disease will always be wrapped in plastic. Therefore, this disorder is often referred to as Boy in the Bubble Disease or childhood diseases in bubbles. 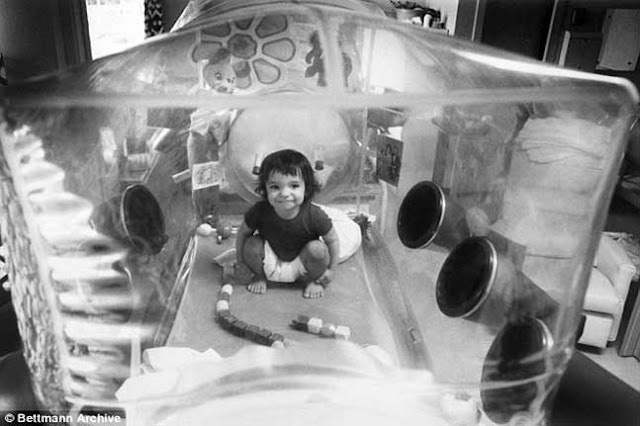 In 1976 the film The Boy in the Plastic Bubble raised the true story of a David Vetter who had this disease. David was forced to isolate plastic bubbles to prevent the entry of viruses and bacteria from outside air. Actually, this disorder is caused by a number of genes, including those that cause defects in both T and B cell responses that cause disruption of lymphocyte production or a type of white blood cell. Cyclopia (cyclocephaly or synophthalmia) is a congenital disorder (birth defect) characterized by a failure of prosencephalon in the embryo to divide the part of the eye cavity in two. 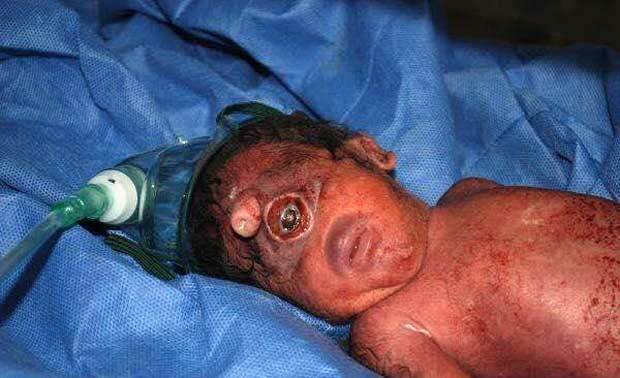 Cyclopia causes formation failure especially in the head, sometimes the nose appears like a trunk above the eye or back, the baby who is experiencing this is likely to die immediately after giving birth. The main cause of this disorder is a poison that has high levels of teratogenic alkaloids namely cyclopamine and 2-deoxyjervine which can be found in the plant Veratrum californicum. This toxin interferes with the Embryo to divide the left and right brain so that only one part of the optic lobe and olfactory lobe are formed which causes the formation of one eye and one ear. MOMO syndrome is a rare genetic disorder that causes overgrowth. The name MOMO itself comes from 4 aspects of macrosomia (overweight), obesity, macrocephaly (excessive head size), ocular (visual impairment). MOMO also comes from the name of a famous fat king Momus-Rei Momo. This disorder occurs every 1 in 100 million births in the world. 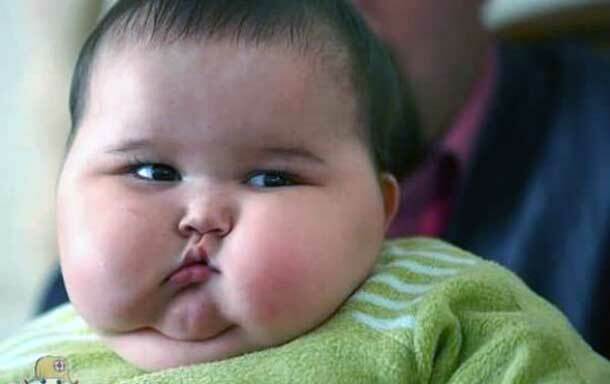 One of the famous MOMO cases is the case of Archie Thompson who was born in 2002 in Icklesham, England, weighing 3.7 kg. After 15 months, the weight increased sharply to 25 kg. When 2 years old weighs 38 kg, this condition puts heavy pressure on the lungs and heart. 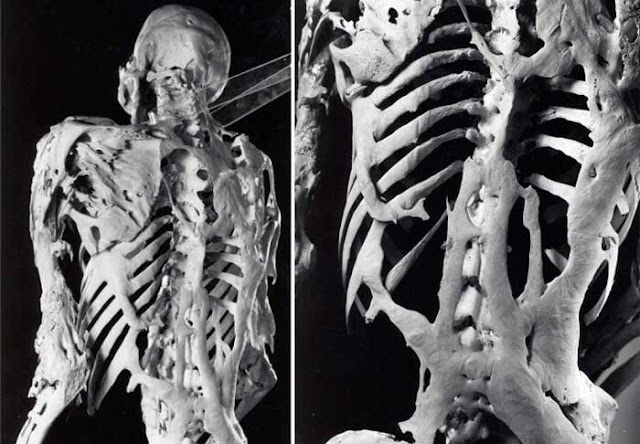 Fibrodysplasia ossificans progressiva (FOP) is a very strange mutation phenomenon in the body's regeneration system. FOP makes the injured muscles, tendons, and ligaments stiffen and harden into bones. People who suffer from this will not be able to move their body parts because of the interlocking bones. They cannot move their legs, arms, mouth, and experience respiratory problems. The most famous FOP case is the case of Harry Eastlack (1933-1973). This disease was felt when he was 10 years old gradually his entire body hardened into a statue. Finally, he died at the age of 40 due to Lung Inflammation. But he advised donating his body to scientific research. Evidently now Harry Eastlack's skeleton is stored at the Mütter Museum in Philadelphia as a center for FOP disease studies. In Indonesia, this disease reminds us of Sulami, a wooden man from Sragen who was diagnosed with Ankylosing Spondylitis, a type of arthritis which also makes the sufferer stiff.